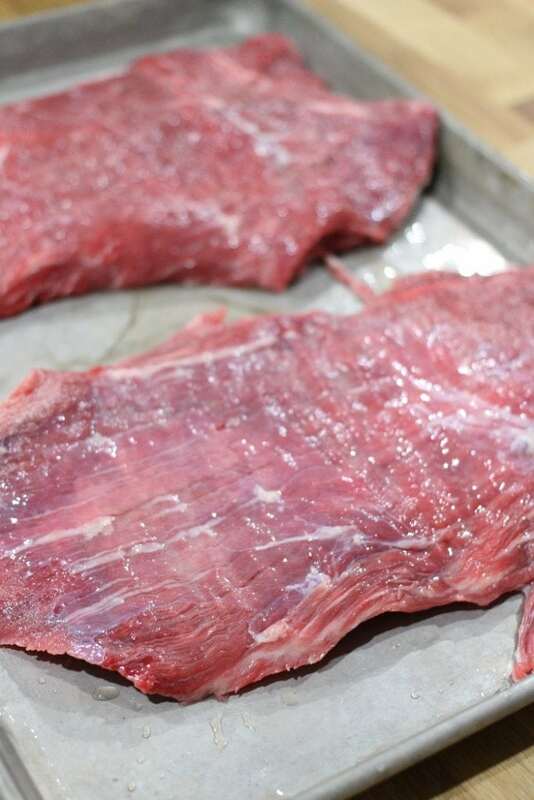 Follow these simple steps to make a perfect broiled flank steak every time! 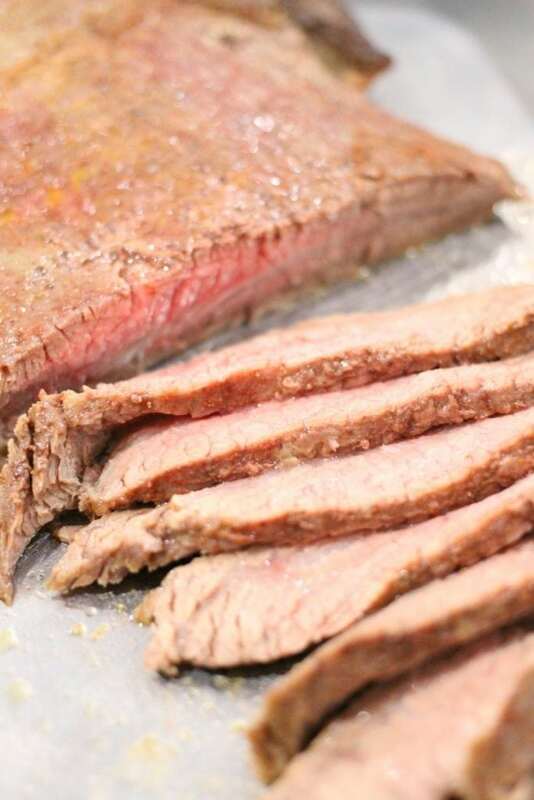 Let us teach you how to broil flank steak! I didn’t always know how to broil flank steak! Confession time! Seemingly for-evvvver I was terrified to make flank steak. I had it a few times at restaurants and it was overcooked and so I figured if a restaurant couldn’t get it right, then I had no hope. But a few years ago, the hubster really wanted fajitas and I was thoroughly tired of chicken, so I finally decided to try my hand at flank steak. And it’s SO easy to make flank steak in the oven! Serve it up with some mashed potatoes and roasted brussel sprouts! 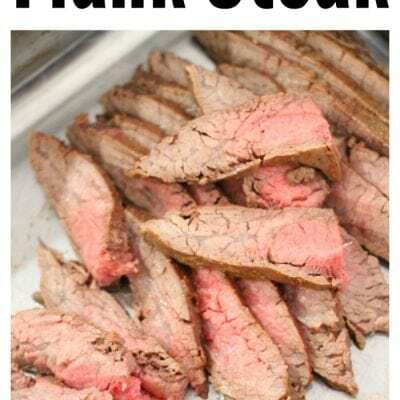 Flank steak (oven) – Easy to make! And turns out, it’s really easy! Also remarkably tasty for such an inexpensive cut of meat. Flank steak works perfectly in salads, sandwiches, on a plate with a fork, and -of course- in fajitas. I used to do it on the grill all the time, but now with five kids it’s not always convenient to run into the back yard to cook the meat. So recently I tried broiling and voila! Flank steak perfection. Admittedly without those pretty grill marks, but no ones gonna see them inside the fajita anyway, right?! Flank steak is a thin cut of steak taken from the abdominal muscles or buttocks of a cow. Many Folks mistakenly believe that flank steak and skirt steak are the same thing but, despite being very similar, they are actually two distinct cuts. That said, you can generally use them interchangeably. You can marinade the steak overnight to further tenderize (here’s my favorite marinade), but don’t stress out if there’s not enough time. A little olive oil, salt, and pepper will do the trick just fine. I like to add a touch of garlic powder as well. Arguably the most important thing about flank steak isn’t how you cook it, but how you cut it. Flank steak should always (always, always) be cut against the grain. Meaning, cut perpendicular (like a T) to the lines or striations in the meat. Doing this makes the steak tender and easy to eat – perfect for fajitas and sandwiches where you’re not cutting each bite individually. 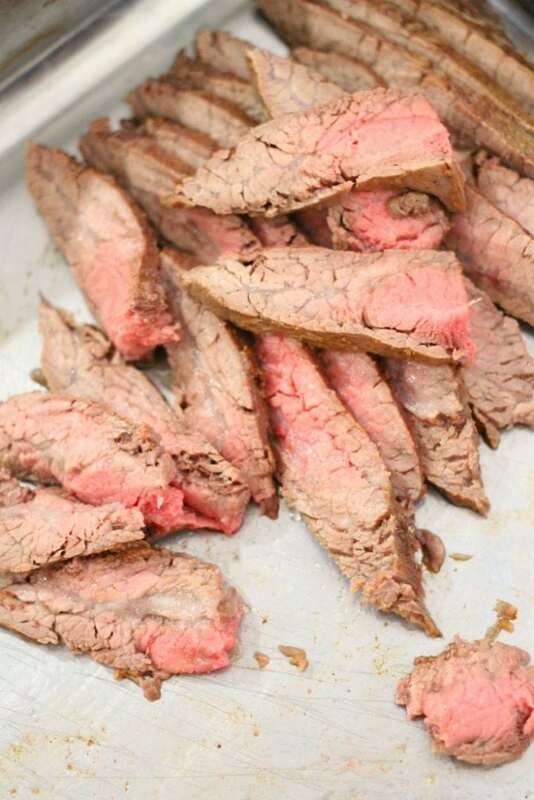 Follow these simple steps to make a perfect broiled flank steak every time! If you like your steak medium well or well done (no pink), put your oven rack at the highest setting, then turn your oven to broil before you start prepping, and let it come up to temperature. If you like your steak more rare (yay!) don't preheat. Rub the steak all over with your favorite marinade (here's my favorite marinade!). 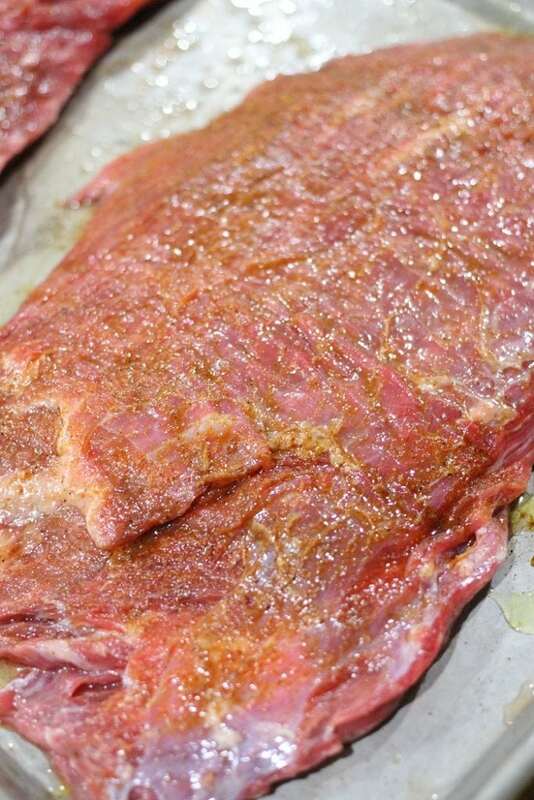 If you don't have any marinade, rub some olive oil all over, then sprinkle a bit of salt and pepper on all sides. I like to add a little garlic powder as well. You can do this part up to 24 hours in advance, and keep it in the fridge. Lay steak on a sheet pan and place on the highest rack (closest to the broiler). Turn on broiled and set timer for 4 minutes. Then flip steak over and return under the broiler for an additional four minutes. This should yield a beautiful medium rare on the ends and rare in the center (as pictured). If you like your steak more well done, return it to the broiler in 90 second increments on each side until desired doneness is reached. Allow to rest a few minutes, then slice thinly AGAINST the grain. My goodness, you know your meat. I have a ‘skirt’ laying in my freezer that I bought spur of the moment last week. i was wondering what to do with it, but…. since it’s interchangeable with flank it’s fajitas all the way for me. 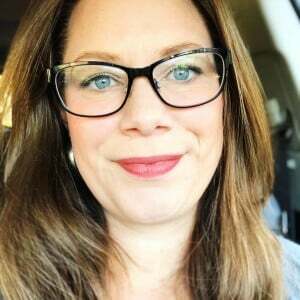 Thanks for all this great info. fajitas are the best! yay! I love flank steak, we don’t make it often and I’ve never tried making it under the broiler, but that is about to change! it’s a great option when the grill is a no-go!